It is very easy to redirect the output of the Ant script into a separate a file using DOS command utility. Just follow the basic simple steps. Step2: Run the Ant script(build.xml) e.g. Managing weblogic through ANT is very easy and handy sometimes, Few days back I was just trying Connection pool creation using Apache ANT, So wants to share with you all. After running the ANT Task you will see the following output in the console. If you want to configure some other types of Connection pool, Do check the MBean associated with that type(if you have weblogic access, see the right side info, and click on<> link, a new pop up will open and see the MBean name for that type. Note: Always use t3 protocol instead of HTTP while connecting Weblogic using ANT. We can generate builds with the build version information using ANT, All we have to do is to create a separte properties files, save it parallel to the Build.xml. Step 2: Specify the Vesrion information in the META-INF of the WAR/EAR using the below code. Sometime when we are building war/ear very frequently using ANT specially during product pre release days then it become very difficult to maintain which dist has been generated when. To track that we can add the details in the META-INF of the war/ear using ANT. Checking out a code from Starteam is very simple in Ant, First of all add the starteam related jars in the classpath. and then write down a Ant task in build.xml. If you are accessing the Starteam over firewall, then dont forgot to break the firewall and then try this task. Just a creative fun found in Apache ANT, there is a task in Apache ANT where we can show Splash screen. 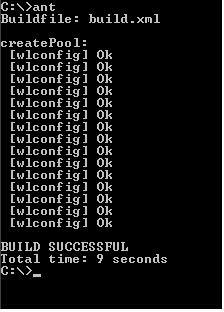 This screen will appear automatically when build get started and close when build creation ends.